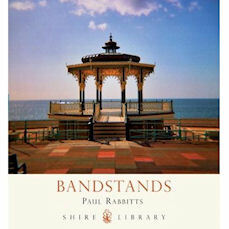 Bandstands, by Paul Rabbitts, Shire Publications Ltd, 2011. ISBN-10: 0747808252, ISBN-13: 978-0747808251. This is one of the Shire series of slim volumes that take particular topics relating to the history, heritage, culture and technologies of the past. They are usually very well illustrated and researched. This is one of very few published items dealing with the history of the bandstand, which in Victorian and Edwardian times was often the main venue for entertainments in the parks and open spaces of the country. Thankfully, although many have been lost over the years to neglect, there have recently been a number of successful renovation and rebuilding projects for bandstands. Brass bands today still provide hundreds of concerts each year in park bandstands in the UK. The literature of bandstands is very sparse – the other known volumes are noted below – and much of the knowledge of the “lost” bandstands remains only in pictures in archives or on the picture postcards of those vintage days. Some of these are collected online in the Vintage Bandstands site.